We’ve spent a long time working on BirdsEye behind the scenes to make it run faster, smooth, and offer better tools for world and local birders. Some of the more exciting features are listed below. 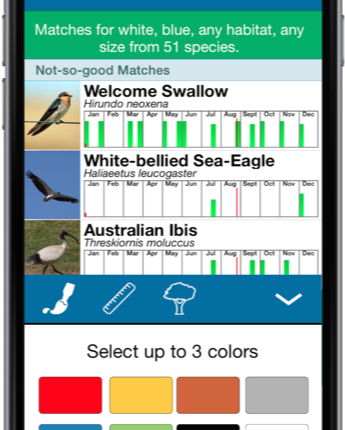 Use color, size and habitat to quickly narrow down the list of nearby sightings to find what you are looking for. Just stepped off the plane in Sydney, Australia and want to know what that blue and white swallow hawking insects around you is? A couple taps and you’ll know that you are looking at a Welcome Swallow! Smart Search is targeted to the traveling birder and new birders, helping you quickly learn the birds wherever you are in the world. Not happy with one of the Smart Search results? Just swipe left over the entry and click the Feedback button to let us know! We’ll keep improving the data behind the scenes to make it all work perfectly. A link to this amazing resource of bird calls and songs is now available in BirdsEye. Tap the link icon on any bird description or map screen to get a direct link to xeno-canto recordings for that species! As in earlier versions of BirdsEye, you also have links to see bird pictures in Flickr and to additional information on species in Wikipedia. Offline content like images and sounds are now more robust, so it is less likely to be deleted by your phone if you are running low on storage. We want to make sure you can always access the data you need no matter where you are! You can now select any month, or group of months, to filter sightings when checking out Hotspots or a spot in your Favorites. 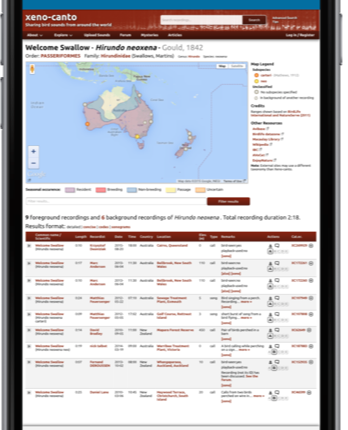 We love this feature for planning trip – create a group of Favorites along your route and choose the month you’re travelling – all of the species reported in the last 5+ years for those months and location will be shown along with their abundance for the locations. Plan ahead to get the most out of your birding! Enjoying the update? Reviews and ratings get reset for each release. If you are feeling generous, please leave a review. Thanks in advance!